With everyone enjoying or enduring the hottest summer since who-knows-when and the increase in conversations about the warm weather (even surpassing the number recorded during our snowy winter), here’s a few little known weather stories you could use to interrupt Tim from accounting during his latest retelling of the most effective number and positioning of electric fans to keep your house cool. Even with the glorious weather across the UK recently, we locals know that rain is never far away and therefore neither should our trusty raincoat be. Imagine your dismay, however, if (like the first wearers of the Mackintosh raincoat in the early 1800s) your Mack melted in hot weather thus leaving you at the mercy of passing showers and thunderstorms, and presumably with bits of raincoat dripping on your flip-flops! Hooray for Thomas Hancock then, the man who improved the rubber of the Mackintosh company coats, patenting his method for vulcanised rubber in 1843 and so keeping your raincoat from melting into a sticky goo in the summer months. That was inspired by (a terrible) summer. 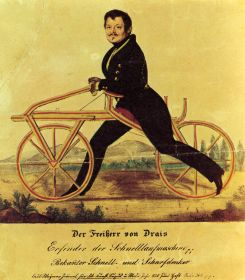 One of the earliest forms of bicycle was invented by Baron Karl von Drais around 1817. His Laufmaschine (running machine) is more similar in style to the modern bicycle than the Boneshakers or Penny-farthings of the late 19th century, however, unlike its asymmetrical counterparts it had no pedals. What sort of weather could possibly inspire a man to create the bicycle? A warm summer’s afternoon with nothing to do, perhaps? Not at all: in contrast to the high temperatures we are currently enjoying, the summer of 1816 became famous due to its complete absence. In what would come to be called ‘the year without summer’ (see what they did there), changes in climate and volcanic events conspired to produce temperatures so low that harvests failed across Europe and North America. In Switzerland an ice dam formed in the gorge below the Val de Bagnes that lasted until 1818! The ruined harvests meant that much of Europe was starving and there was not enough grain to feed the horses, this led von Drais to seek alternative modes of transport and led him to invent his Laufmaschine. With climate change and renewable energy being the hot topics of the new millennium you would likely not bat an eyelid at the news that an electric London taxicab came to the Science Museum last year. You might, however, be surprised to hear that the first time that cab came to London was in 1897! The Bersey taxi company had 75 all-electric taxis roaming the streets of 19th Century London and picking up fares. Unfortunately they made a huge loss for their owner and the company was dissolved in 1899, but the idea was a brilliantly ambitious one. 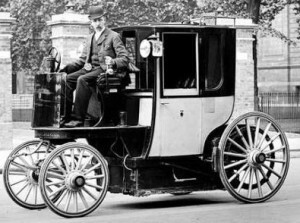 At a time when most London cabbies were ferrying passengers by horse and cart, the electric taxi had multiple advantages: it took up less room; was much less likely to kick its hind legs or defecate and was much, much quieter than anything else on the roads at that time, making it less likely to scare the horses. Its range, however, was not to be boasted of – every 30 miles the cab would have to be back at base for a replacement battery. In London this was less of a hindrance than might be thought, as according to TfL via thechargingpoint.com, the typical cab journey in London is just 3.2 miles. Ultimately it was the heavy running costs due to electricity generation and tyre degradation (no soft suspension or smooth tarmac for the Bersey boys) that led to the failure of this incredible enterprise. We imagine that the inventor, Walter Bersey, would have embraced the next generation of taxi-electricity combination and booked his next cab online. For the days you wish you could sit in a human-sized thermos flask. The Indian inventor and businessman Kranthi Kiran Vistakula has developed clothing to combat the extreme changes in temperature found in dangerous climates such as the desert. His first product is a jacket which, complete with rechargeable batteries that can last up to eight hours, weighs only a little over 1kg. It is the weight of the garment that sets it apart from other similar inventions that tend to be far too heavy for any practical use. The invention has been suggested for use by the medical industry (with a sideline being developed that will stop bleeding from wounds through the use of heat) and the military, particularly to help Indian soldiers combat the heat of the Rajasthan border with Pakistan, where temperatures can hit 50 degrees C. The invention works through something called the Peltier effect (wikipedia it, didn’t help me much though!) and cools key parts of the body for maximum body temperature control without requiring a mechanism that cools the entire body, hence its lightweight build. An all too common occurrence? Here’s one of my own, inspired by the ‘minor delays’ on the Northern line last week and the general microclimate on the tube in these summer months. If you’re a rush-hour tube user you doubtless have your own ideas for improving the service, whether it’s air conditioning or just actually having them run on weekends and on time (crazy thought eh!). 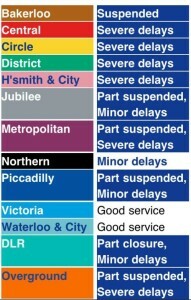 This, however, is what strikes me as a quick and easy project: ‘minor delays’ seems to relate to, for example, anything from an extra five minutes waiting time to no trains on the Bank branch and all others too busy to get onto (not that this stops many people trying). Thus, why not have a live feed or updating picture of the tube station and/or train that can be accessed over the internet on your way to the station, allowing you to make up your own mind about whether to just stay on the bus or not. The cameras are already there, why not use them?